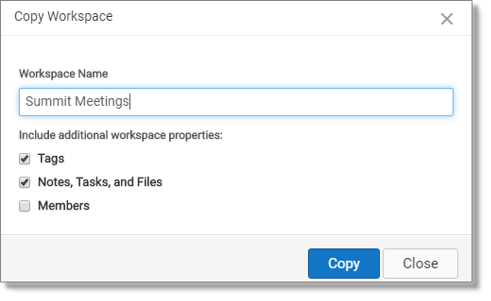 To create a copy of an existing workspace, clone the workspace, including any of its contents and members. You can then repurpose the cloned workspace. For example, you can use the cloned workspace to collaborate on a continuation of a completed project, keeping the same members and files, or just the files, or just the members, as for the original project. In the panel at the left, click the Feed icon . Select the workspace you want to clone. In the panel at the upper right, click the More Actions icon , and then select Workspace Settings. Click Clone Workspace. The Copy Workspace window opens. Enter a new name for the cloned workspace. Select the workspace content you want cloned to the new workspace. You can clone tags, members, or notes, tasks, and files. In the panel at the upper-right, click the More Actions icon , and then select Workspace Settings. Click Delete Workspace. The Warning window opens. 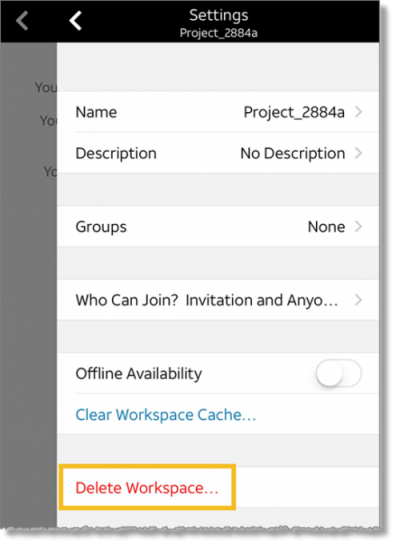 In the Feed panel, tap the workspace you want. In the menu, tap the More Actions icon . Tap Delete Workspace. The Delete Workspace windows opens.